LOS ANGELES, CA--(Marketwired - Sep 5, 2017) - Blaze Fast Fire'd Pizza, the fast-casual artisanal pizza concept known for its chef-driven menu and casually hip restaurants, announced today that it will open a new Texas location, in College Station, on Thursday, September 7th. To celebrate the grand opening, the College Station restaurant will offer FREE build-your-own artisanal pizzas on Thursday, from 10:45 a.m. to 10:30 p.m. to anyone who follows Blaze Pizza on Instagram, Twitter, or Facebook. The highly anticipated restaurant, which features a 2,600 square foot interior with seating for 80 and an exterior patio, is located in the Century Square (143 Century Square Drive). Blaze Pizza is a modern day "pizza joint" serving up artisanal pizzas that are both fast and affordable. Since its first restaurant debuted in 2012, Blaze has quickly become one of the nation's hottest restaurant concepts, with fans lining up each day for the custom-built pizzas, freshly made salads, blood orange lemonade and s'more pies. Each restaurant features an interactive open-kitchen format that allows guests to customize one of the menu's signature pizzas or create their own, choosing from a wide selection of fresh, artisanal ingredients -- all for about $8. The generously-sized personal pizzas are then sent to a blazing hot open-flame oven -- the centerpiece of the restaurant -- where dedicated pizzasmiths ensure that the thin-crust pies are fast-fire'd and ready to eat in just 180 seconds. Restaurants make their own dough from scratch using a recipe developed by critically-acclaimed Executive Chef Bradford Kent (the "Pizza Whisperer"), which requires a 24-hour fermentation period to produce his signature light-as-air, crisp crust. 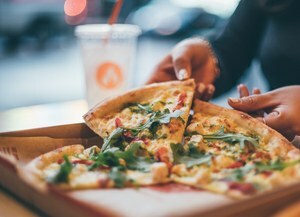 All of the pizza and salad ingredients are free of artificial flavors, colors, preservatives and for pizza fans with specific dietary needs, Blaze Pizza offers gluten-free dough and vegan cheese. The College Station restaurant will also feature a selection of draft beer.